Do you have a mindful morning routine? They might seem like funny questions, but how you choose to use those first few minutes upon waking can have a huge impact on the rest of your day. If you’re like most people, you probably wake up to the sound of an alarm clock. Followed by the snooze button. And then the snooze button again. Why have a mindful morning routine? Starting the day off in a rushed panic is a perfect invitation for stress and chaos. Top that off with some caffeine and your mind is running around untethered, bouncing from thought to thought wasting energy and precious moments. Cultivating a mindful morning routine is a great way to center yourself before heading out for today’s adventures. It gives you an opportunity to experience calmness, peace, and to enjoy these precious moments. Morning routines don’t need to be complicated or take a lot of time either. 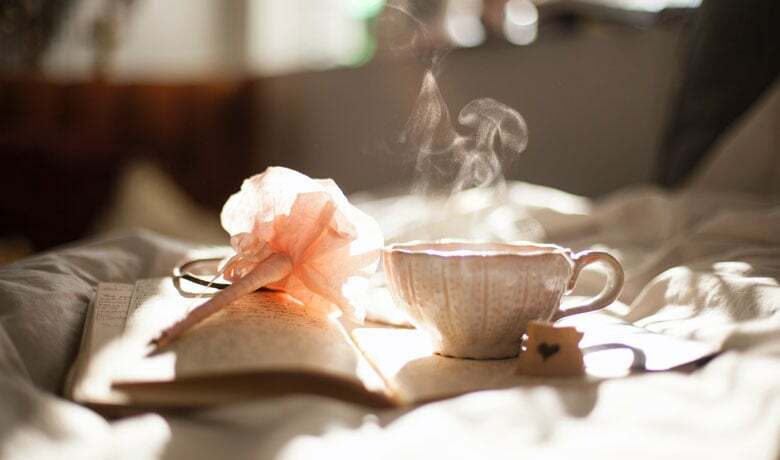 Here are 5 easy tips to help you get started on your own little wake up ritual. The moment you begin to feel yourself waking, resist the urge to either hit the snooze button, jump right out of bed, or reach over and grab your phone. Take some time to become aware of your surroundings and to engage your senses. Start to notice things such as the softness of the pillow behind your head, the warmth of the sheets around you, the comfort of the mattress below you. Check in with your body and scan over it acknowledging whatever feelings you might be experiencing such as comfort or tension. Once you’ve connected with your body, take a few breaths while still lying in your bed. If you need to set your alarm for a few minutes earlier to make time for this, then do so. Try to break away from the habit of being jolted awake by your alarm and then shifting directly into autopilot to rush through your morning routine. Focus instead on being present. Connect with your body by bringing your awareness to your breath. Enjoy the peaceful sensation that comes after several full deep belly breaths. Start to transition yourself away from the shock of a cold shower or a strong blast of caffeine to get you going. Invite some gentle movement to your morning. Wake up your body with stretches or some yoga. This light movement will bring fresh oxygen to your organs and get your blood circulating. Other benefits of morning stretches include: improved posture, energy levels, and increased range of motion. Before you start diving into breakfast or your morning dash of caffeine, have some water. Water gently rehydrates your body and replenishes the fluids you lost during sleep. Drinking water in the morning can help to improve digestion, skin, and energy levels. It can also help reduce junk food cravings and excess food consumption immediately upon waking. Reaching for a cup of caffeine in the morning can interfere with cortisol levels which are generally highest in the morning. Mornings are a great time to practice meditation. They’re quiet, relatively undisturbed, and don’t yet carry the same burden of stress you’d experience at the end of a full day. Align yourself for the next 24 hours by taking some time to get grounded. Take up a practice such as sitting meditation, walking meditation, yoga, tai chi, qigong. Whatever form of meditation resonates with you today is a good place to begin. Maintaining a mindful morning routine doesn’t have to take a lot of time. If you learn to be adaptive, your mindful practice will evolve with you as your schedule changes. Whenever possible, try to practice around the same time each day. This will make your practice more habitual and easier to stick with. Small changes to your morning can bring lots of added peace to your day.